In general the studio is geared to adults. Children over 12 are allowed with parental supervision. Several times a month we offer Kid Friendly Hours where children are welcome with their adult to come create in our beautiful studio. Click here to register for upcoming Kid’s Clinics. Yes! Please call or come by and schedule a new-member orientation ahead of time, or sign up for a class. For those who’d like to work together on a group mosaic (we can accommodate up to 6 people during open hours), see our Group Options page. 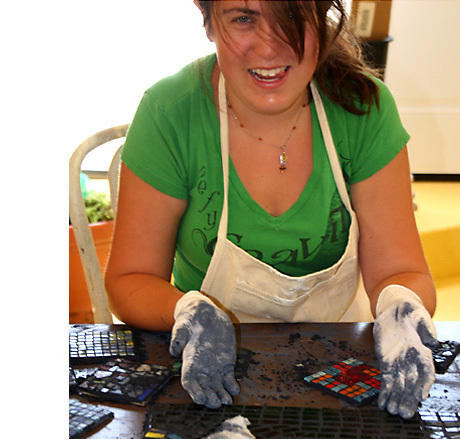 If you are interested in creating a memorial mosaic, you may schedule an appointment with Claire. Additionally, folks who have either been members or taken a class here may come in for an Independent Study – click here for more information. Call to set up an appointment. Can I buy mosaic tools and materials at the studio? Yes, we have a huge selection of beautiful tiles to choose from, as well as various mosaic tools and supplies for purchase. Can I bring my own materials to mosaic with? Because of the way our studio works, it is difficult to mix and match our materials with yours. Therefore, we ask that you please choose from our selection of tiles while working at the studio. We can help you work in very special or meaningful tiles on an individual basis. Do I need to know how to mosaic already to become a member? No previous experience is necessary for membership. We will guide you/teach you each step as you work on your own mosaic. I heard that you also do glass fusing – how can I learn to fuse? We do offer glass fusing lessons. We schedule monthly Introduction to Fusing classes for both members and non-members, as well as occasional themed classes. You can find more information and see the current schedule by clicking here. Members can also schedule custom, one-on-one fusing classes according to availability. We also carry many fusing supplies as well as a large selection of fusing glass. Do you take donations of glass or tile? We can take certain glass donations, but we generally can’t take ceramic tile donations. If you have a picture of what you’re hoping to donate, that is always very helpful for us. If you don’t have a picture, give us a call or come by and we’ll see if we can take your glass. And thanks for thinking of us! We love keeping materials out of the landfill. Can I eat or drink while I’m mosaicking? It is best not to mix food and mosaics, as we don’t want anyone to end up eating or drinking glass shards!! If you have a cup with a lid on it, that is alright. Do you sell completed mosaics? Most of the mosaics on display at the studio are samples only, however, we often have a show hanging in our gallery space. Many times the shows include mosaics for sale. Stop by anytime to see what is hanging! And remember you can always come create your own mosaic in a class or as a member! Also, Seattle Mosaic Arts does commissions.